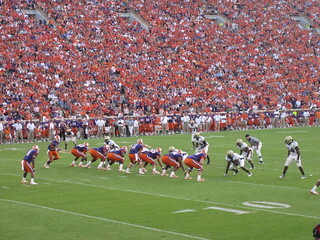 Georgia Tech has been a thorn in Clemson head coach Dabo Swinney’s side since he became head coach. Swinney has won just one game in five tries, but his Clemson Tigers have a new mindset and toughness about them, as well as boasting the nation’s fifth-longest active home win streak. Can Swinney and the Tigers reverse their fortunes against a struggling Yellow Jackets squad? Paul Johnson’s Yellow Jackets are off to a less than stellar start at 2-3 after losing the last two to Miami in an overtime thriller and Middle Tennessee State in a blowout. Johnson has questioned his team’s manhood and challenged them to step up on both sides of the ball. Last season, the Tigers and Jackets squared off after Tech lost its previous two games. Clemson will always get Georgia Tech’s A-game and best shot because let’s face it- the two teams aren’t very fond of one another. Tech is led by second-year starting quarterback Tevin Washington, who leads the ACC in touchdowns scored with 11. Washington is very capable of running the triple-option offense and has even scattered in a few nice throws this season. He is becoming a better-rounded quarterback which could be scary for Clemson’s defense. The Jackets also have running back Orwin Smith, who has rushed for 245 yards and two touchdowns. The Tech defense has been a concern as of late, giving up over 500 yards of total offense and 91 points over the last two games. However, the Jackets have had key injuries to outside linebacker Jeremiah Attaochu and cornerback Louis Young, who are both expected to return this week. And, defensive coordinator Al Groh had a lot of success against Clemson last season dropping eight into coverage and pressuring Clemson quarterback Tajh Boyd. Offensive Coordinator Chad Morris has the Clemson offense clicking on all cylinders through the first five weeks of the season. Coming into the season, all eyes were on wide receiver Sammy Watkins, but Watkins’ absence in three games has forced other playmakers to step up. Most notably, Nuk Hopkins, Jaron Brown, and Brandon Ford have stepped up their games and proven that this offense doesn’t revolve around Watkins. Andre Ellington is healthy for the first time in his Clemson career, which has paid dividends for the Tigers. Ellington has had three career games so far this season- two rushing career highs and on career high in receiving yards. The Tigers are going to score and score a lot. The key to this game will be the Clemson defense. Can the Tiger defense do their jobs and stick to their assignments? The matchup that needs to be watched closest will be Clemson’s defensive line versus Tech’s offensive line. Clemson defenders need to get off their blocks and use good technique to avoid the cut block on the inside. After shedding the blockers, just hit somebody. Whoever has Washington, hit him on every play. Whoever has Smith, hit him. Just hit somebody. The Jackets are going to get their yards and they are going to score, but the key- as is every week- is not giving up the big play. The defensive line and linebackers must contain Washington on every play and the secondary can’t get lulled to sleep by long stints of running plays because eventually Johnson will dial up a pass. Twelve of the last 17 games have been decide by five points or less, making the series one of the most competitive in the country; however, this one won’t be as close. Points will be scored by both teams, but the key will be for the Tigers to get points on every possession, and based on Tech’s defensive performance this year that is very possible. This game will be close heading into the fourth quarter, but the Tigers offense will just be too much for a Georgia Tech defense that lacks depth. Post written by Clemson Girl's Sports Bloggess, Nikki Steele.